Formed in 2005 and ineffectively dubbed as “dark metal,” Germany’s Nachtblut snagged a deal with the venerable Napalm Records, who decided to re-release the band’s 2009’s Antik. As German-sounding as their name would suggest, Nachtblut churn out a relatively harmless effort of Gothic-meets-industrial black metal, set to the tune of raspy vocals sung in all German. Rammstein this is not; in fact, we’re not quite sure how to peg this one. Over the course of the albums’ 14 offerings (four of which are bonus tracks added on for the re-release), Nachtblut avoids the trappings of traditional German Goth metal ala Crematory, favoring a more poppy and industrial flavor. Nevertheless, there’s plenty of tight leather pants zipping and pop metal cred to songs like the opening title track, and “Die Mutter die ihr Kind verlor,” two songs that manage to stick out from the pack. The real tipping point for Nachtblut as a whole is singer Askeroth, who eschews the normal I’m-singing-in-German-therefore-I-have-a-throat-that-is-thoatier-than-yours style that normally comes down the pike. Instead, the man’s demonic black metal whistle tries its darndest to strike a counterbalance to the light metal that flutters in on “Ijobs Botschaft” and “Kreuzigung.” The prevailing notion that comes from this pairing is that Nachtblut is making a concerted effort to not sound like their countrymen, but by doing so, might have pushed the uniqueness meter a little too far. 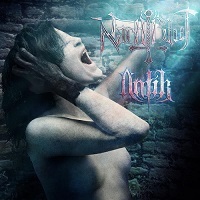 With a limited appeal and low ceiling, Nachtblut might need to tinker with their formula if they want to many any headway in the cruel game that is European Goth metal. While it’s a safe assumption they’re not one of the dime-a-dozen Goth bands that spawn albums at an alarming rate, it’s an even safer bet that with Antik, they’re going to confuse people more than they will enthrall them.